When one has (too?) 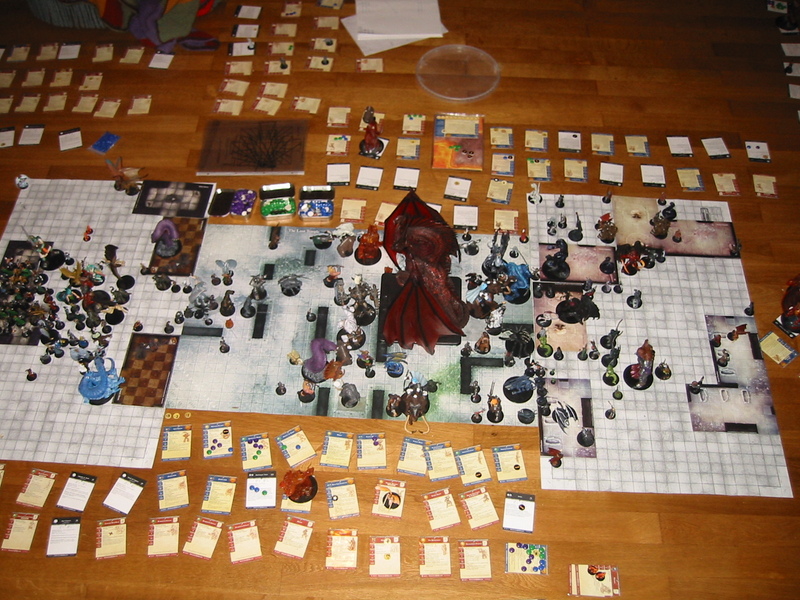 many D&D miniatures standing around, strange ideas pop up. 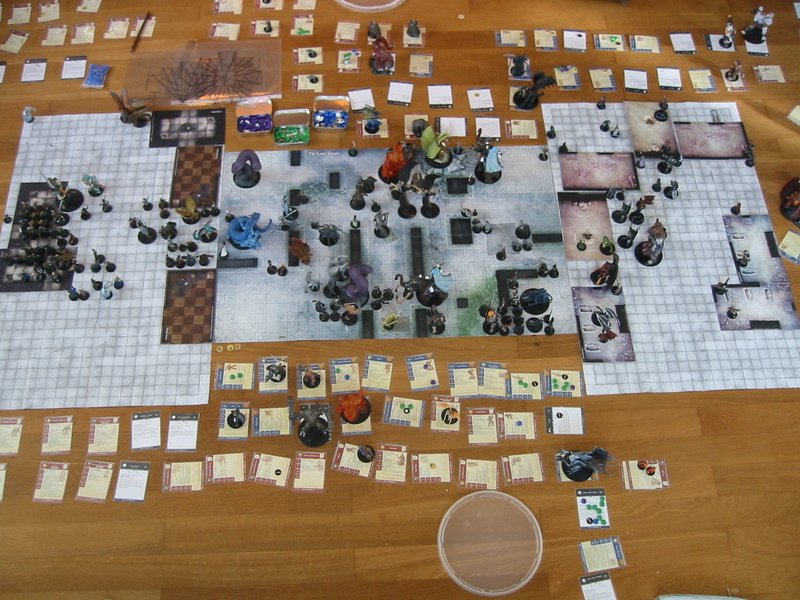 We had had a running challenge 1000 pts vs. 1000 pts, the rules being that each time one won a battle, one would get "+1 level" on one's boss, the other one would get +10% on his points to spend on his warband. So far I had lost once, giving me 1100 points, and several levels on my aspect of bahamut, Tobi had one level on his sorcerer on black dragon - and 1770 points. 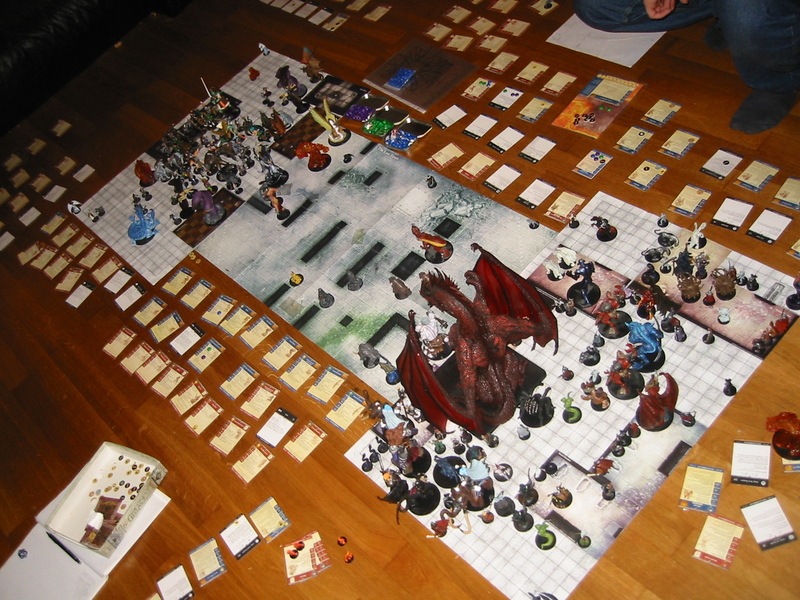 We then decided to add 9000 points to each warband, and give each two factions ... Good vs Evil, the classic conflict. Additionally, per 1000 pts only 12 minis were allowed - plus one for each previous loss. 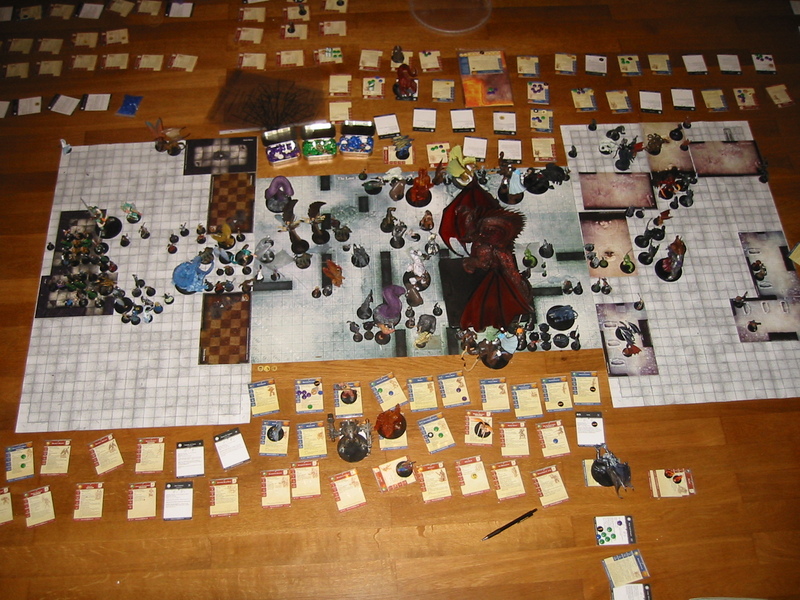 So Good had 121 minis maximum, plus creatures to be summoned during battle. 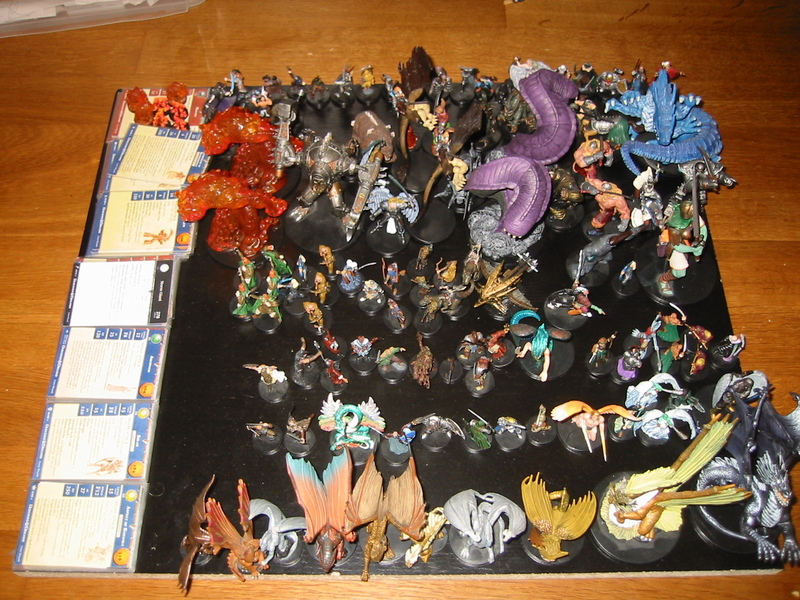 So this is my warband - front row: the dragons, second the commanders, third, the spellcasters, then the ranged attack unit, behind them two rows of melee, and in the back seats the uniques - the back left holds summonables for the bonded fire summoner (and Elminster). Oh, in case you're wondering what those colored chips are for - they're damage counters: blue is 5 points of damage, green is 10 and purple is 25. We just didn't have enough of the original ones to keep track of the tremendous amounts of damage we dealt. 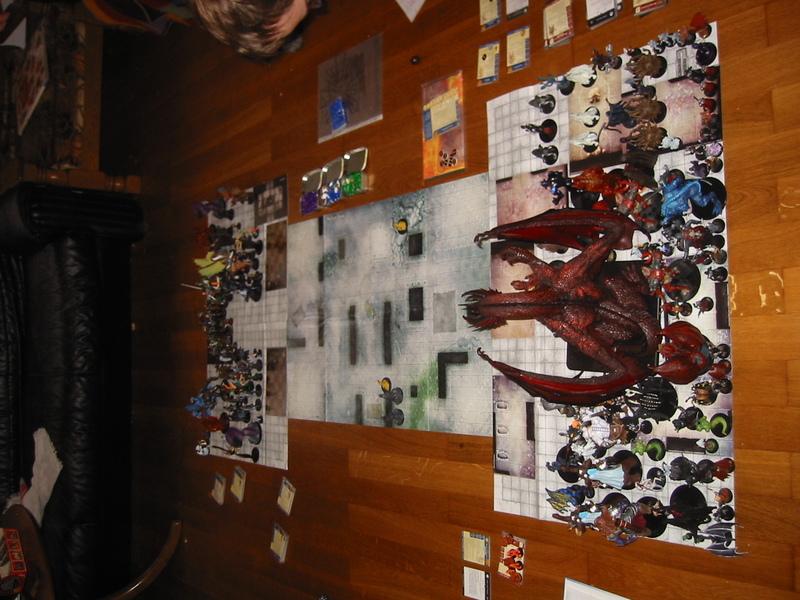 Huge Red Dragon Evil 216 by a ranged crit from Aramil! Glabrezu Evil 269 by Mialee's Magic Missile! Q: Turn 4 was much less successful for Good than all the others? A: The key lay in turn 3, when Evil put all non-commanders out of command ... As a result of this, Tordek ran away (Elminster had to dim-door in and quick cast a remove fear on Tordek, that's how he came to do useful stuff without interruption), and Good was out-manoeuvered badly. And Good made several bad choices on who to let live at the beginning of turn 4. The Glabrezu, Erinyes and Githyanki that had dim-doored into my ranged/spellcasting division could have been avoided to make kills at all. (Including the Bonded Fire Summoner, Mialee, Nebin and Elf Pyromancer. Only the Summoner hurt, because he'd represent a total of 6 activations - the others had nothing useful left). Q: How come Tordek was so horribly successful? 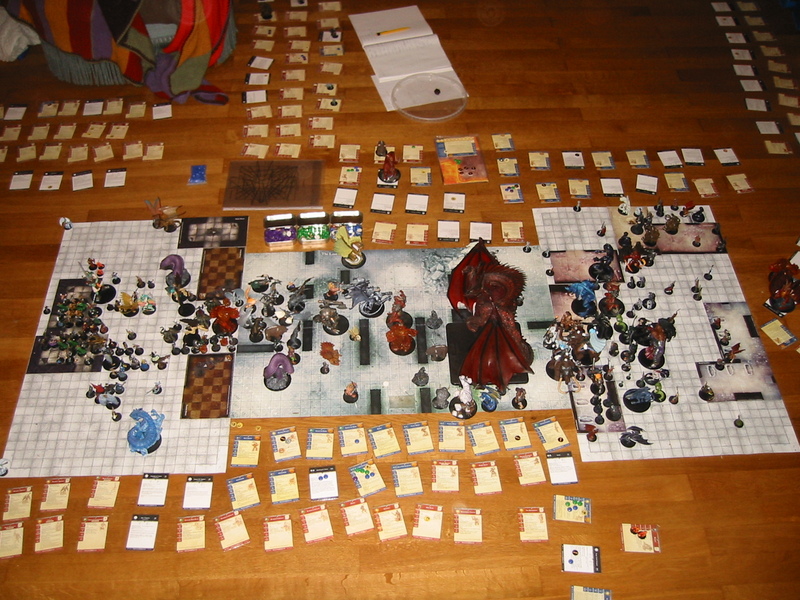 A: The teleport behind enemy lines, plus some magic items (he carried nearly everything Good had, including the Shirt of false life, that carried him through to round 5 - he would have died in round 4 otherwise), several buffing spells (including Elemental Protection from Fire, regeneration 5, blur) that gave him an AC of 30. Additionally, the Trumpet Archons gave him access to Commander Effects over line of sight, and careful planning was put into having him in LoS from the Solar, Dark Traveller andBrass Samurai, not to forget the Ghaele Eladrin... giving him AC 34, whirlwind attack with damage 55 and melee reach 2, and when he rolled a 19 or 20, he got to activate one more time the same round. That, and his prime targets (the Beholders) are slow.